Most of the land-surface subsidence in the Houston-Galveston region, Texas, has occurred as a direct result of groundwater withdrawals for municipal supply, commercial and industrial use, and irrigation that depressured and dewatered the Chicot and Evangeline aquifers, thereby causing compaction of the aquifer sediments, mostly in the fine-grained silt and clay layers. 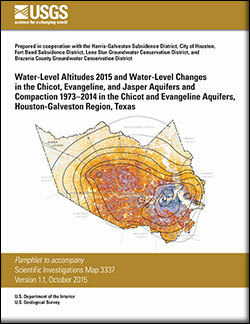 This report, prepared by the U.S. Geological Survey in cooperation with the Harris-Galveston Subsidence District, City of Houston, Fort Bend Subsidence District, Lone Star Groundwater Conservation District, and Brazoria County Groundwater Conservation District, is one in an annual series of reports depicting water-level altitudes and water-level changes in the Chicot, Evangeline, and Jasper aquifers and measured cumulative compaction of subsurface sediments in the Chicot and Evangeline aquifers in the Houston-Galveston region. The report contains regional-scale maps depicting approximate 2015 water-level altitudes (represented by measurements made during December 2014–March 2015) for the Chicot, Evangeline, and Jasper aquifers; maps depicting 1-year (2014–15) water-level changes for each aquifer; maps depicting approximate contoured 5-year (2010–15) water-level changes for each aquifer; maps depicting approximate contoured long-term (1990–2015 and 1977–2015) water-level changes for the Chicot and Evangeline aquifers; a map depicting approximate contoured long-term (2000–15) water-level changes for the Jasper aquifer; a map depicting locations of borehole-extensometer sites; and graphs depicting measured cumulative compaction of subsurface sediments at the borehole extensometers during 1973–2014. Three tables listing the water-level data used to construct each water-level map for each aquifer and a table listing the measured cumulative compaction data for each extensometer site and graphs are included. In 2015, water-level-altitude contours for the Chicot aquifer ranged from 175 feet (ft) below the vertical datum (the National Geodetic Vertical Datum of 1929 or the North American Vertical Datum of 1988; hereinafter, datum) in a localized area in northwestern Harris County to 200 ft above datum in northern and western Montgomery County. Water-level changes for 2014–15 in the Chicot aquifer ranged from a 24-ft decline to a 31-ft rise. Contoured 5-year and long-term water-level changes in the Chicot aquifer ranged from a 40-ft decline to a 40-ft rise (2010–15), from a 100-ft decline to a 100-ft rise (1990–2015), and from a 100-ft decline to a 200-ft rise (1977–2015). In 2015, water-level-altitude contours for the Evangeline aquifer ranged from 250 ft below datum in a localized area extending from south-central Montgomery County into north-central Harris County and in an additional area located in central Harris County to 200 ft above datum in southeastern Grimes and northwestern Montgomery Counties. Water-level changes for 2014–15 in the Evangeline aquifer ranged from a 66-ft decline to a 78-ft rise. Contoured 5-year and long-term water-level changes in the Evangeline aquifer ranged from a 60-ft decline to an 80-ft rise (2010–15), from a 200-ft decline to a 240-ft rise (1990–2015), and from a 320-ft decline to a 240-ft rise (1977–2015). In 2015, water-level-altitude contours for the Jasper aquifer ranged from 200 ft below datum in south-central Montgomery County that extends into north-central Harris County to 250 ft above datum in northwestern Montgomery County. Water-level changes for 2014–15 in the Jasper aquifer ranged from a 17-ft decline to a 35-ft rise. Contoured 5-year and long-term water-level changes in the Jasper aquifer ranged from a 60-ft decline to four small, localized areas of 10-ft rises (2010–15) and from a 220-ft decline to no change (2000–15). Compaction of subsurface sediments (mostly in the fine-grained silt and clay layers) composing the Chicot and Evangeline aquifers was recorded continuously by using analog technology at the 13 borehole extensometers at 11 sites that were either activated or installed between 1973 and 1980. For the period of record beginning in 1973 (or later depending on activation or installation date) and ending in December 2014, measured cumulative compaction at the 13 extensometers ranged from 0.101 ft at the Texas City-Moses Lake extensometer to 3.668 ft at the Addicks extensometer. During 2014, a total of 10 of the 13 extensometers recorded a slight net decrease of land-surface elevation; the extensometers at the Lake Houston and Clear Lake (shallow) sites recorded slight net increases of land-surface elevation, and the extensometer at the Texas City-Moses Lake site recorded no change in elevation. The rate of compaction varies from site to site because of differences in rates of groundwater withdrawal in the areas adjacent to each extensometer site and differences among sites in the ratios of sand, silt, and clay and compressibilities of the subsurface sediments. It is not appropriate, therefore, to extrapolate or infer a rate of compaction for an adjacent area on the basis of the rate of compaction measured at nearby extensometers. Kasmarek, M.C., Ramage, J.K., Houston, N.A., Johnson, M.R., and Schmidt, T.S., 2015, Water-level altitudes 2015 and water-level changes in the Chicot, Evangeline, and Jasper aquifers and compaction 1973–2014 in the Chicot and Evangeline aquifers, Houston-Galveston region, Texas (ver. 1.1, October 2015): U.S. Geological Survey Scientific Investigations Map 3337, pamphlet, 16 sheets, scale 1:100,000, https://dx.doi.org/10.3133/sim3337.